Those of you who are regular visitors will have heard me speak of a charming Edinburgh doctor who tends to my ailments; he is an absolutely charming chap, very sure-handed when it comes to a wrist weakened by too much wielding of the quill. I would certainly not trust my ills with any other but perhaps I would make an exception for Dorothea Erxleben, a pioneering lady of medicine. Dorothea was born into a medical family, the daughter of Anna and Dr Christian Leporin, who ran a medical practice in Quedlinburg, Germany. Something of a maverick who decried the lot of women who were compelled to remain at home, Leporin recognised early on that Dorothea was at least as intelligent as her brother, Tobias, who was preparing to follow the doctor into medicine. When Tobias was sent for private medical tuition, Dorothea went along with him and proved herself a more than promising student. Rightly not happy to let her education languish, when Tobias took off to complete his studies at the University of Halle, Leporin and Dorothea petitioned Frederick the Great, arguing that the young lady should be permitted to study at the University. Frederick received the petition with interest and Dorothea was admitted to Halle, though her studies and graduation were somewhat delayed when Tobias was drafted. Rather than go to university alone, Dorothea married widower Christian Erxleben and together they raised his five children, also having four of their own. Throughout this period, Dorothea practiced alongside her father to treat the poor for precious little renumeration. The doctor died in 1747 and she toiled on without him, earning the animosity of others who thought that she was improper, unladylike and immoral, arguing that the very idea of a female doctor was too much to countenance. The doctors argued furiously that she should be immediately stopped from practicing. It was decided instead that she must take her final exams and receive a licence to practice. Dorothea took the latter option and graduated in 1754, going on to a tend the ailments of Elizabeth, Princess of Holstein, though she never let these noble clients names her from the less fortunate patients. 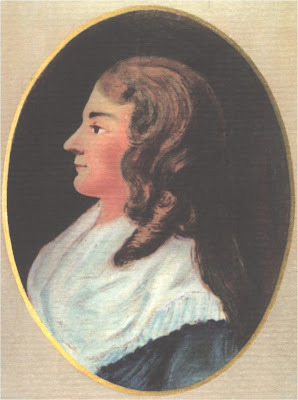 Dorothea became Germany's first fully qualified and licensed doctor and wrote eloquently on the subject of medicine and the place of women in society and education. It would be nice to report that many more followed her pioneering lead but in fact, it would be almost 150 years before another German woman followed in her footsteps. I have to say though, if my Edinburgh medic were otherwise disposed, I would be happy to consult this most impressive lady! Such enlightened parents and a remarkable woman. Great story. Challenging times to undertake such a career choice, I'll warrant.